MUCH OF THIS MATERIAL WAS LOCKED AWAY IN OUR SAFE FOR YEARS! The 173 pages of this book contains some of the most valuable WD Gann Courses ever written by the father of technical analysis. It contains his secret technical analysis methods applicable to the stock and commodities markets that were once known only to a handful of people. During the 1930's these same WD Gann trading courses sold for thousands of dollars. It makes a fine addition to any trader's library. METHOD FOR FORECASTING THE STOCK MARKET. One of the most valuable courses ever written by Gann, this was also his first. 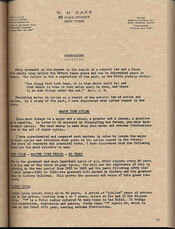 Written in January, 1931, this course laid the foundation for later writings such as "Master Charts" and "Forecasting". Those who think Gann did not develop the two "Master Squares" until the 1950's will be surprised to see them both laid out in this course. Just a few of the other topics covered are: Saturn and the 30-year cycle, "Master Timing Angles", instructions for forecasting the stock market, and the relationships between the human body and time cycles. GANN MATHEMATICAL FORMULA FOR MARKET PREDICTIONS. THE MASTER MATHEMATICAL PRICE, TIME, AND TREND CALCULATOR. 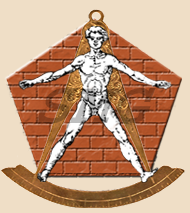 Clearly shows the importance of the Square of Twelve, 144. Those using the 60-year cycle will be surprised that in this course Gann called the 56-year cycle the, "Great Cycle" because it is based on 144. There is much more valuable information not contained in any of his other writings. 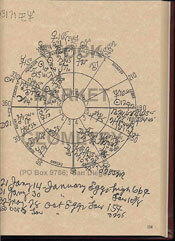 GANN'S PERSONAL ASTROLOGICAL CHARTS. Shows how Gann used astrology to determine time angles. Also described is Gann's "MOF", or mean of five, and "COE", or cycle of eight. Very few "Gann experts" have ever heard of either of these and even fewer know how to use them. COFFEE SANTOS; COFFEE RIO. Written one year before his death, this letter shows how Gann used the degrees of the planets to determine price and time levels. The numbered squares of Coffee Rio and Coffee Santos are also provided along with the, "vortex" chart of Coffee Rio. SOY BEAN PRICE RESISTANCE LEVELS. Another letter written by Gann, this shows how to use the degrees of the zodiac to determine resistance levels in soybeans. "Active Angles" and the importance of 24 to soybeans and other markets are explained. NATURAL RESISTANCE LEVELS AND TIME CYCLE POINTS. This is one of the lessons included in the "Gann Master Courses" that others are selling for as much as $1,300. It is included here in its entirety because the subject matches well the other material in this book. HOW TO MAKE PROFITS TRADING IN PUTS AND CALLS. Options have become very popular with traders since index options began trading in 1982. They provide huge amounts of leverage so the trader can make large profits (or losses) with very little capital. Gann shows his strategies for trading options with this course written in 1937, one of the first produced on the subject. HOW TO SELL PUTS AND CALLS. This 1941 course shows various strategies used by Gann to sell options. The same strategies work today. FORECASTING. Gann's advertisements stated that he described his "Master Time Factor" in this course. Variations of this course were released at later dates deleting certain critical material. This is the 1935 original. AUBURN MOTORS. Included in this hard to find course is a 1930-1931 price chart of Auburn Motors. This allows you to follow the chart as Gann is describing it. 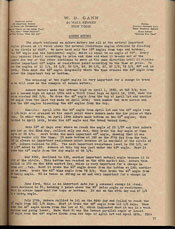 APPENDIX A - WYCKOFF INTERVIEW WITH WD GANN IN 1909.